Yikes! This isn't really a review, seeing as this show was, as so helpfully (and alarmingly) stated above, 34 years, 5 months, and 14 days before this writing. But I checked this site just to make sure my memory did not deceive me--yes, they really did play a 1500-seater in freakin' Terre Haute! I drove w. my then-beau, Lenny, and his die-hard-fan friend Neil, from Bloomington. I recall that the group was as good as one would expect them to be, but frankly, I found the sound too loud for that venue. I suppose it was worth that and the awful cold of that night, as I still appreciate that I got to hear Wakeman live, and as the band was most accommodating to audience folk, Neil getting to go backstage. As an odd little sidenote, I *think* this was also the first time I ever saw people flick their lighters during a show! Gah, now it's cell phones. Do I feel old . . . I was at this show, my first of many more. I was in the bleachers on the left side as you face the stage. Anybody else remember that they blew the beginning of I've Seen All Good People and Jon Anderson had them restart the song???? I believe this was the show this happened at. Never had seen a band do that before but it was worth it, they nailed it the second time. This also was the show that impressed mw with just how good these guys were Live. Quite faithful to the recordings and even better in a lot of cases. Great show as noted. Amazing to have CTTE performed in a gymnasium.... I and another DJ, Tom Jackson, drove from the University of Missouri-Columbia to Terre Haute. We had set up an interview and stayed afterwards and talked to Steve a while. After finishing taping about 1/2 hour, we left backstage and the band had already left for the Holiday Inn, leaving Steve and his acoustic guitar behind. We, of course, offered a ride, he took us up and ever so gently he placed his guitar in the trunk. After getting to the hotel, Steve graciously offered to continue the interview which went probably another 30-45 minutes. Very genuine, open and what passion about his music! Some post concert food was readied said Brian Lane(? ), Steve even invited us, but we took our leave. Still have the tapes too! 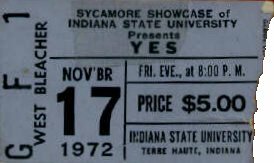 This was my second YES concert...the first was MRF back in July, which did occur contrary to what is written here and it was Alan White's first concert with YES. I have four other witnesses who attended that one! I was a Junior in high school when I saw this show. Took my girlfriend and we had pretty good seats in the bleachers to the left of the stage. A totally electrifying show to say the least. The floor must have been open festival as I remember everyone packed shoulder to shoulder and surging toward the stage. A friend caught Jon's tambourine after he smashed his fist thru it and threw it into the crowd. I was a fan for about a year at the time and had Fragile and CTTE so I was familiar with most of the songs. The music was so incredible I was shaking in my seat with emotion. I'll never forget the experience.